The Branch will be holding two Pay Meetings where members can come along and find out more about the pay campaign and consultation. 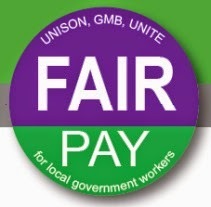 The Scottish Employers have rejected UNISON’s 2014 Pay Claim for £1 per hour and consolidation on of the living wage. It is their view that pay has been settled until April 2015. This is because, after UNISON members accepted a 1% rise in 2013 in good faith, the employers imposed 1% for 2013 and 2014. The decision to move to a consultative ballot was taken at a meeting of all council branches. UNISON wants all our members to have a say on how we go forward to challenge the erosion of our pay over the past four years. Inez Teece, Branch secretary said, “Many of our members are low paid and a 1% pay rise, even with the living wage and the Aberdeenshire uplift, is still paltry when you think that we live in one of the most expensive parts of Scotland. Kate Ramsden, Branch Chair added, ” We believe that our members are worth decent pay. That is important not just for us but for the local community, as public sector workers we spend up to 90p of every pound we earn back in our local shops and businesses. And we pay our taxes! “Day after day our members go out to work for the people of Aberdeenshire. No wonder the council says that staff are their greatest resource.